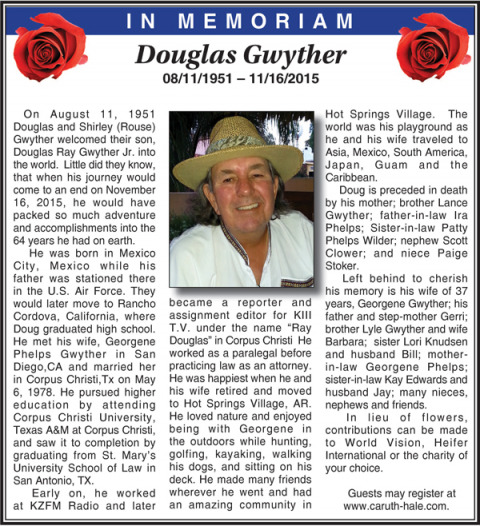 On August 11, 1951 Douglas and Shirley (Rouse) Gwyther welcomed their son, Douglas Ray Gwyther Jr. into the world. Little did they know, that when his journey would come to an end on November 16, 2015, he would have packed so much adventure and accomplishments into the 64 years he had on earth. He was born in Mexico City, Mexico while his father was stationed there in the U.S. Air Force. They would later move to Rancho Cordova, California, where Doug graduated high school. He met his wife, Georgene Phelps Gwyther in San Diego, CA and married her in Corpus Christi, TX on May 6, 1978. He pursued higher education by attending Corpus Christi University, Texas A&M at Corpus Christi, and saw it to completion by graduating from St. Mary’s University School of Law in San Antonio, TX. Early on, he worked at KZFM Radio and later became a reporter and assignment editor for KIII T.V. under the name “Ray Douglas” in Corpus Christi. He worked as a paralegal before practicing law as an attorney. He was happiest when he and his wife retired and moved to Hot Springs Village, AR. He loved nature and enjoyed being with Georgene in the outdoors while hunting, golfing, kayaking, walking his dogs, and sitting on his deck. He made many friends wherever he went and had an amazing community in Hot Springs Village. The world was his playground as he and his wife traveled to Asia, Mexico, South America, Japan, Guam and the Caribbean. Doug is preceded in death by his mother; brother Lance Gwyther; father-in-law Ira Phelps; Sister-in-law Patty Phelps Wilder; nephew Scott Clower; and niece Paige Stoker. Left behind to cherish his memory is his wife of 37 years, Georgene Gwyther; his father and step-mother Gerri; brother Lyle Gwyther and wife Barbara; sister Lori Knudsen and husband Bill; mother-in-law Georgene Phelps; sister-in-law Kay Edwards and husband Jay; many nieces, nephews and friends. In lieu of flowers, contributions can be made to World Vision, Heifer International or the charity of your choice. Guests may register at www.caruth-hale.com.